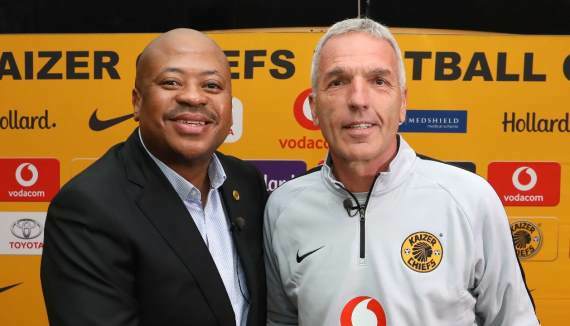 Kaizer Chiefs manager Bobby Mataung reveals the club was able to appoint Ernst Middendorp as head coach so quickly after the departure of Giovanni Solinas because the club had been in talks with him for two weeks prior to the announcment. Middendorp is no stranger to South African soil, nor to what is like to manage one of the biggest teams in the country. The German tactician has spent about a decade of his career coaching in South Africa, including a three-year stint with Amakhosi between 2005 and 2007. "Our coach Ernst Middendorp, well known in South Africa, well known in Germany, well known in Africa. He is not new in the family. We had a nice journey with him at the time and we had to part ways at the time. Thankfully we keep relationships in our journey. He is back in the midst with us," Motaung said. "Fortunately for the past two weeks we have been engaging with the coach Ernst. Fortunately he was prepared to come back and he was prepared to assist and take the journey forward. "Coach Middendorp was working somewhere else, but we pleaded with him to come back and requested him to come drive the ship," he concluded.